“Let’s make Christ our president, let’s have Him for our king.” Woody Guthrie wrote these words in the early years of the 20th century, and the sentiment holds weight and fascination almost a century later as it’s echoed in the title of Shane Claiborne and Chris Haw’s new book, Jesus for President. Rather than shoehorning Jesus into the American political system, however, the book is about pursuing a different approach to government entirely. The authors lay out a fresh vision of the way the church and state should interact, eschewing entirely the prevalent notion that we must, in some way, make our mark on the government, because, goshdarnit, this is a Christian nation and we were founded on biblical principles! Claiborne and Haw base their model on the radical lifestyles of both the early church chronicled in Acts and the early life of Hebrew civilization depicted in the Torah. Fortunately the book is not just a dusty dissertation on political philosophy and hermeneutics. This is the work of passionate people talking about the principles they are actively incorporating into their lives. Their enthusiasm is catchy as they lace together anecdotes with history (at least as they see it) with an excitingly post-modern book design, one that frequently veers to the left of traditional layouts. Ultimately, the authors’ conclusions about the way Christians ought to live in the world and practice radical subordination are thought-provoking, if perhaps more radical than most are willing to go. Even if you disagree with the authors’ conclusions, their thoughts are worth reading, pondering and grappling with. 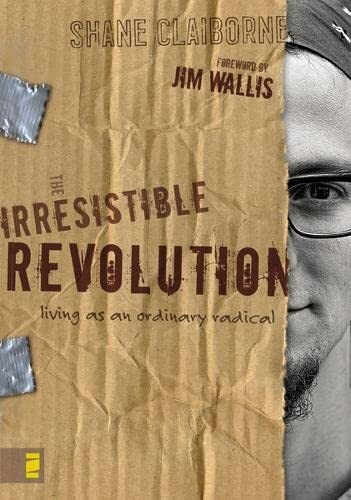 In The Irresistible Revolution, Shane Claiborne combines personal accounts (from his anything-but-normal lifestyle) and scriptural texts of what it means to be a follower of Christ. In a world of megachurches, televangelism and a whole lot of fake Christianity, Shane Claiborne breathes life and hope into what the church was made to look like. He describes the present state of the church as being a fragmented body that has forgotten what it means to love. Throughout the book, Shane challenges the reader to live an authentic Christian life even if that means giving up everything you have. Shane has served with Mother Theresa in Calcutta, people in Iraq and is now part of a community in Philadelphia called The Simple Way. The book is a critical look at and questions the comfy lifestyle that most American’s live. Some points may make you uncomfortable, but if that uneasiness leads you to action than Shane will have seen it as accomplishing its goal. You are currently browsing the archives for the shane claiborne category.